Whenever I need to learn something new, I no longer turn to my dusty books or that cesspool Google. 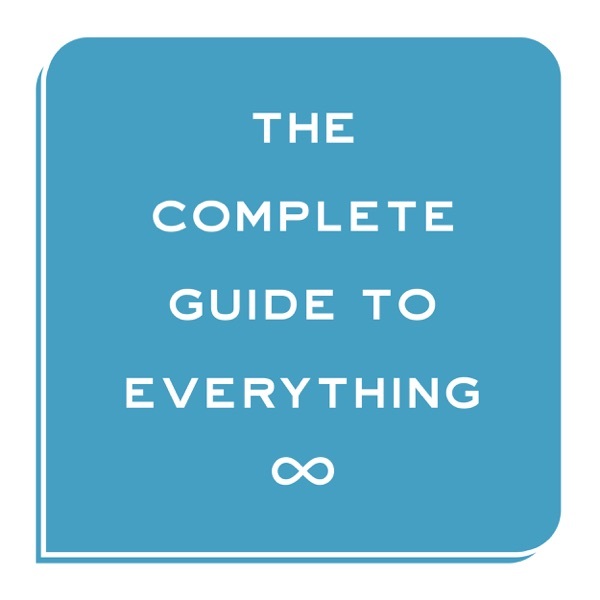 I just turn to the Complete Guide to Everything to get concise, in-depth information about literally everything. Timothy and Tomothy are fluent in every subject (even alcoholism and misogyny). Also worth a listen for the award winning mayo recipe alone! Honestly, my favorite podcast. Love this show. I discovered this podcast a few months back and I am now 5 episodes away from listening to their entire backlog. I’m surprised these guys aren’t more popular than they are. I’ve consumed an unhealthy amount of their content in the last few months, but it was worth it. Their running jokes and hilarious chemistry are seriously the greatest. I started listening in 2013 and I’m still here. Too many people get upset about the show not being very informative, but to me the sarcasm of the title is pretty blatant. It’s 👏🏽not👏🏽a👏🏽literal👏🏽guide👏🏽to👏🏽anything 👏🏽. That’s 👏🏽not👏🏽the👏🏽point 👏🏽. Although Tim and Tom have actually taught me a lot about McDonald’s. This podcast is filled with tangents and off topic BS. If the hosts stayed on topic, providing a beginning, middle, and end (real story telling), this podcast could be condensed to 15 minutes. Absolute garbage, don’t waste your time. Love this show! Although Tim and Tom often get off track, I can’t help but enjoy this podcast. Feels like natural conversation and is very entertaining. Try it out! It sounds like two self-obsessed Millennials channeling Norm McDonald in a pop culture ticket-blowing booth; no thanks. 23 minutes into the podcast and they have yet to discuss the movie... everything from airports to drinking and going to the bathroom. This was a waste of cellular data truly the worst podcast I’ve ever wasted time listening to! Come on guys get some structure! you gotta check this out if you haven’t already!!! this is easily one of the best podcasts I’ve come across. these guys have helped me get through soooo many hours of work. they are just plain awesome!!!!!!! a MUST LISTEN!!! Been listening since about 2009 and haven’t been able to stop. Barely got any information out of this. Tried (extremely hard) to listen to one episode and it’s mostly them just talking about stuff that has nothing to do with the subject. What a waste of time. The sound quality is awful as well. Don’t try listening to this on a morning commute if you don’t want your hearing blown out. One second they’re whispering, almost like they’re on the other side of the room whispering into the mic, then the next second they’re talking at an appropriate level which, after you turn the volume way up to hear them, you think your eardrums just ruptured. Honestly anything else on the subject you’re wanting to listen to would be better than this. A simple google search would turn up more information and waste less time. Wow, are these guys dorky. On The Sopranos podcast they were talking about Subway sandwiches. I unsubscribed very fast. ...in the episode on “Dracula,” they took more than 15 minutes to begin discussing the book, then repeatedly got the name of one of the main characters wrong. So. I never used to listen to podcasts, but after hearing an episode of this, I listen to every new episode the second it comes out! Great job and idea of starting a podcast Tim ‘n’ Tom! First, to the one star review who complained that ten minutes in and they haven’t broached the topic so he gave up... That’s what they do! They start out most episodes asking how the others week was, what they saw, etc. it’s usually about 15-20 min. Guess you missed out, buddy. I have every single episode available on iTunes downloaded on my phone, and once I get to the end, I start over and catch up all over again. They are great friends with exceptional comedic timing. Tim is an old man in a young mans body who loves jeopardy and the price is right, hates teenagers (even fears them), and generally judges other people for things that he doesn’t like, yet will act the same way about his own interests. Listen through, you’ll see plenty of examples. Tom. He loves superheroes and has a bunch of knowledge on the topic. Tim frequently mispronounces names and gets the companies wrong to rile Tom up. He won our hearts by eventually adopting Ginger and we get to see her updates on Instagram. They are both hilarious, but Tim seems a bit meaner than Tom, so I think Tom is funnier - more laid back and less irritated by things. Btw, Tom apparently hates service people and refuses to tip. Tom denied it, but surely Tim wouldn’t spread such a rumor... Over time you really learn a lot about these two and it is weird in that they have no idea I exist but I feel like I have shared all these podcast recordings in the room with them. A warm, friendly couple who give their opinions on a topic week after week, whether they are qualified or not. Also check out their Patreon for weekly minisodes. Pop Everything is another attempt at a podcast that is rarely updated, though. Give an episode a try, you’ll be hooked. Great guys. I’ve listened to them so much it’s hard to say if they’re just my type of humor, or if they’ve built my type of humor. 10/10 love this podcast. It’s like finding the exact type of people you would want to hang around every day with. Really love this podcast. I've listened since 2010. It's the only podcast I've listened to as consistently or for as long. I LOVE this podcast!! Tim and Tom have the chemistry of best friends (because they are), and always entertain with their contrasting personalities. I love the variety of subject matter at the beginning of the show (always funny), the main topic, and the problems they solve from fans at the end. My favorite podcast to work out to!! Love it!! I tried. I really did. More than once. It just isn’t good. At all. I found this podcast doing a topic Serge. For a “complete guide” to anything, they sure do seem to revel in ignorance of everything and a desperation to be funny, but neither one of them are capable. That’s an hour of my life that I will never get back. If the Frankenstein episode is any marker of the rest of the series in terms of actually being informative and tone, not worth it. The first 8 minutes has nothing to do with Frankenstein at all.. I stopped in the first 17 minutes. Not really a complete guide but a great way to spend an hour. No other podcast makes me laugh as much and hard as these two guys! Their banter and friendship is #relationshipgoals. I gotta say, I was getting annoyed that after 12 minutes the topic still hadn't gotten mentioned, but then you all started talk about taylor swift fans just searching for taylor swift and didn't expect to get all the beginning! I am actually rolling I can't stop laughing. Funniest duo on the podwaves. This podcast makes me laugh. Tried the first half hour of an episode and they talked about the topic 5% of the time and bullshitted with each other the rest of the time. I’ve been listening to TCGTE for at least 8 years. I don’t know how to describe it other than it’s nice to listen to two familiar voices talk about normal stuff in an entertaining way every week. I know that sounds simple, but this is my favorite podcast and it has been for years. I listen to a million podcasts, and this is my favorite one. I don’t understand how anyone ever gave them less than 5 stars. Thank you both. I’ve listened to Tim and Tom for years now and they have never failed to crack me up. Don’t expect to learn anything, as that seems to be the main criticism of the show, because all it rlly is is random banter between two dudes. But if your like me and can relate to their sense of humor then who cares it’s entertaining! I don’t get the humor and the guys seem to be having a better time among themselves than making the podcast interesting for the listener. I tried fast forwarding but then I found myself half way through the podcast. I have been listening to this show for years, and I love it. I listen to many podcasts and this one has remained my all-time favorite. It keeps me laughing every week! I’ve been listening to this podcast for... is it possible it’s been nearly a decade? My husband and I find ourselves starting conversations at the dinner table: “Did you listen to Tim and Tom yet?” I subscribe to many ‘casts and end up behind on many of them, but I never miss a week of this one. Grade A banter and ridicule. Came across an episode on Area 51 while researching the topic. Popped it on, went for a run. A half hour into the run, the hosts still hadn’t gotten on the subject matter, but had plenty of discussions about inside jokes regarding toilet paper. Like listening to two vapid girls in a Starbucks. Hilarious. These guys are my age and their humor is especially perfect if you were born 1979-1982. You will likely catch more of the references if you’re from that generation. this is the best podcast i've listened to in 8 years of listening. tim is really great and an excellent stand up dude. tom's alright. Just listened to the Tea Episode hoping to learn a little more about Tea. I found the show from just searching iTunes for the word tea. The show was about an hour long but had less than 2 mins of that time spent on the topic. Hosts talked more about Burlington coat factory than the title of the show. I’m sure it’s good if you want to listen to two guys talk about their lives but a guide to everything it is not. Maybe consider a new show name. It's pretty common for podcasters to make some small talk before they begin expounding on their topic...but why did I just listen to 17:30 MINUTES of bathroom speculation talk before I learned about Teslas? A bit much.